As Rome roiled last weekend, what many consider to be Stateside Catholicism's holiest ground -- namely, the University of Notre Dame -- hosted a key member of the reigning pontificate's inner circle on his first major US visit. Now prefect of the Congregation for the Causes of Saints -- and, ergo, at the front of the queue for a red hat at the next consistory -- Archbishop Angelo Amato SDB served as #2 to then-Cardinal Ratzinger and Cardinal William Levada at the Congregation for the Doctrine of the Faith before being named the church's saintmaker-in-chief in June. Before succeeding his Salesian confrere Tarcisio Bertone at the former Holy Office in late 2002, as a consultor to the CDF Amato is widely believed to have been the key author behind what would become Dominus Iesus, the Congregation's 2000 decree on revelation in other faiths (or the lack thereof). Along the way, he also took a lead role in the Vatican's assault on The DaVinci Code before its theatrical release in 2007. 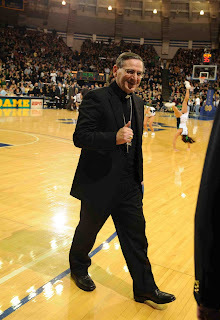 In South Bend, the archbishop celebrated and preached Sunday's main liturgy (fullvideo) in the university's Basilica of the Sacred Heart, looked on (and received a standing ovation from the crowd of 13,000) as UConn ended Irish basketball's home win streak at 45 on Saturday night and, most prominently, gave a Monday night lecture on "Catholicism and Secularism in Contemporary Europe" before a packed lecture hall, with a full overflow room watching via closed-circuit. "What I Can Give Back"